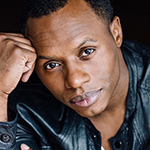 Malcolm Goodwin is an actor, director, producer and writer. Goodwin has directed and produced independent commercials, short films, sketches, music videos and public service announcements, and as an actor has been featured in various films and TV shows, including American Gangster, Detroit 1-8-7, Leatherheads, and Breakout Kings. Goodwin currently stars as Det. Clive Babineaux on the CW series iZombie. While he is primarily known to most as an actor, he is also an accomplished filmmaker. After completing a two year internship at Liberty Studios in NYC, Goodwin went on to produce eleven short films. The first, Get Home Safe, was one of six films selected into the 14th Annual Showtime Black Filmmakers Showcase. He has produced, directed and edited 70+ short form videos for the web and various clients. In the past five years Goodwin has directed four feature films: A True Story (Winner of Best Narrative Feature for Toronto Film and Video Festival / Distributed by Freestyle Releasing), Construction (Audience Award Kansas International Film Festival), Pass the Light (DiginextDistribution), and Be the Light (currently in post-production). After completing the Directors’ Workshop, he directed an episode of iZombie (CW).